This cheery space blends mid-century modern style with newer pieces. Built in the 1950s, this Pawtucket, Rhode Island, ranch has the clean lines and open spaces that are hallmarks of mid-century design. “The homeowners love the architectural heritage of the house,” says Arlington interior designer Meghan Shadrick, noting that “over the decades very little had been done to it.” After living in the house for five years, the owners decided it was time to enliven the living room. “They wanted to create a fun place where they could entertain,” says Shadrick. Staying connected to the home’s modernist roots, Shadrick paired vintage mid-century pieces with new furnishings, designer fabrics, and off-the-shelf accents. Bold splashes of color, pattern, and texture now infuse the sunny space with a cheerful energy. 1. Vintage Moroccan brass mirrors add drama. 2. The abstract painting is by Kristen Dowd. “The jolt of color behind the sofa draws your eye and shakes things up,” says Shadrick. 3. Two blue and white ceramic lamps by Ralph Lauren purchased at HomeGoods are timeless. “Every decade, classic Asian pottery style lamps pop up,” says Shadrick. 4. A neutral Crate & Barrel sofa has a subtle mid-century feel with its wooden legs. Throw pillows provide color and pattern. 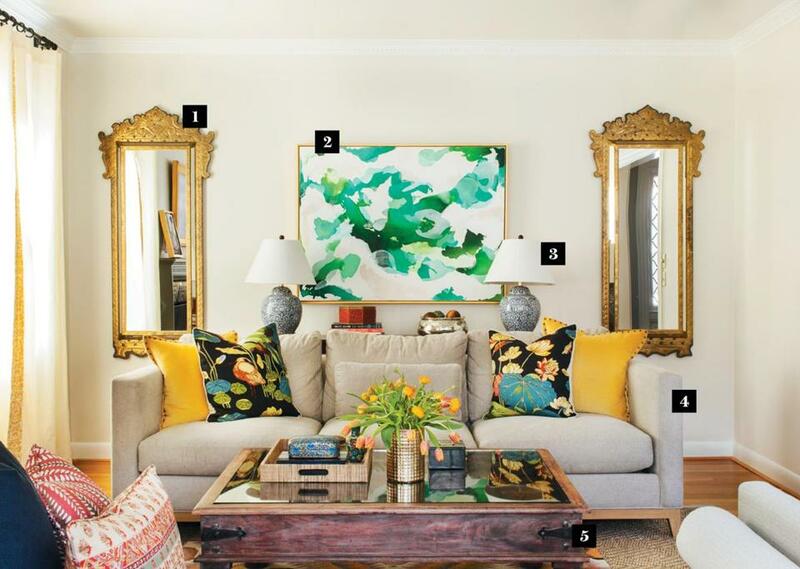 The gold pillows are from West Elm; the custom floral ones are by Lee Jofa. 5. An antique coffee table from India brings in a rustic element. “We wanted to let it be in its imperfections,” says Shadrick. 6. Shadrick salvaged parts of an early 20th-century Asian room screen and transformed them into art with a Lucite frame. 7. Pottery Barn curtains are jazzed up with custom trim made of yellow and white paisley fabric by F. Schumacher. 8. 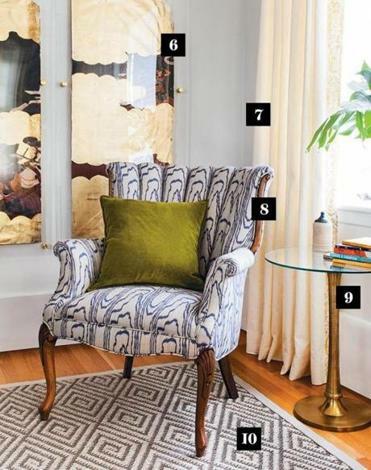 A 1950s chair was reupholstered in a blue and white fabric with a retro feel by Kelly Wearstler. 10. A sisal rug in a classic Greek key pattern adds texture but doesn’t overwhelm the room.